eBay Club Condition Guide Learn about our condition ratings and what to expect when you purchase a certified club from Callaway Pre-Owned. Outlet Outlet Like New Very Good Good Average Outlet Outlet Condition: This is our highest rated Certified Pre-Owned condition. Outlet condition clubs have never been hit. However, they cannot be sold as new as they could have been floor samples or demo clubs. Outlet condition clubs could exhibit some minor scuffs on the sole or other form of shop-wear. Outlet Condition - What It Means... Grip: Always a high quality golf grip. Shaft: No signs of any wear or use. No bag wear. Face: Perfect sharp grooves with scoring lines and paint fully intact. Sole: May have a few brush marks but otherwise perfect. Like New Like New Like New Condition: These clubs are nearly impossible to differentiate from new. They have been hit very few times, if at all, and show almost no wear. These clubs may have been refinished at some point. Like New Condition - What It Means... Grip: Always a high quality golf grip. Shaft: Few signs of any wear or use. No bag wear. Face: Perfect sharp grooves with scoring lines and paint fully intact. Sole: May have a few brush marks but nearly perfect. Topline/Body: Maybe a scratch or two from being in a bag with other clubs. Very Good Very Good Very Good Condition: Unlike our Like New condition, these clubs have clearly been hit but are in fantastic shape. They may have a few scratches if you look closely but will still look like the newest club in most bags. Very Good Condition - What It Means... Grip: Always a high quality golf grip. Shaft: Slight signs of wear or use. Graphics still in place. No bag wear. May have a few paint chips from rubbing against other clubs but are otherwise structurally perfect. Face: Polished look of Like New but with slightly more signs of play. All of paint-fill still in the grooves. Sole: Polished look Like New but with a bit more wear. Light wear from where club has brushed through the grass in play. Topline/Body: Few cosmetic scratches from rubbing against other clubs but medallions and overall condition is great. Good Good Good Condition: These clubs have seen normal use (usually several seasons) but are in better than average shape for that particular model club. They may have some cosmetic imperfections but will look better than the average club in most players' bags. Good Condition - What It Means... Grip: Always a high quality golf grip. Shaft: Graphics are still completely visible and little, if any, bag wear. Face: Normal scratches from shot impacts that will not affect performance. Grooves are still sharp and in great condition. Sole: Normal scratches from a couple of seasons of use. These scratches are common for the polished soles on most Callaway Golf woods. Scratches and wear consistent with steady use but no dents or damage that will affect the weight or structural integrity of the club. Topline/Body: Scratches and wear consistent with steady use but no dents or damage that will affect the weight or structural integrity of the club. Average Average Average Condition: These clubs have been used but not abused. They will show normal wear from frequent play and may have natural scratches, pop up marks and/or bag wear on the shaft. These are great clubs for those looking for performance and value and are less concerned about cosmetics. Average Condition - What It Means... Grip: Always a high quality golf grip. Shaft: Graphics may be worn off in places and paint may have worn away. Shafts are still in perfect working condition and have been checked to ensure they maintain the proper flexibility. Face: Grooves will have typical wear from frequent play and nicks that will not affect playability. Paint-fill in grooves may be worn or missing in places. Sole: Typical scratches from heavy use but no imperfections that will affect performance. Such scratches are common on polished soles with most Callaway Golf painted woods. Paint may be missing in areas. Topline/Body: Normal scratches and nicks from rubbing other clubs that affect appearance, but not the playability of the club. Why Buy From Us? Guaranteed Performance 12-Month Warranty Certificate of Authenticity Shipping Information Returns Policy Why Buy From Us? Shipping Information Shipping Information Questions about shipping? In this section you will find information about standard ground contiguous US shipping, Express US shipping and International shipping. United States Shipping to US Most of the products shipped within the contiguous U.S. are delivered via UPS Ground® Services. You also have the option of choosing UPS Second Day Air or UPS Next Day Air as you are checking out. UPS Ground® Services (Flat Rate Shipping & Handling): Orders shipped via UPS Ground® typically take from 1-5 business days to arrive from the time the package leaves our facility. All orders shipped out via ground shipping within the contiguous U.S. will be charged according to our one-price shipping & handling rate of $9.95, regardless of the number of items shipped. Orders placed prior to 2:00PM CST will ship the same day pending verification. UPS Ground Service Schedules Problems with Your Shipment Shipping problems, while not common, can happen. If you have a problem with your order that is related to shipping, please send us a message through your my eBay account. If you have not received your shipment within the expected delivery time, or if the shipment has been delivered but is not in your possession, please include your order number with your message. A Customer Service Representative will process a claim with UPS and give you further instructions. If your shipment arrives damaged, please do not open the box or remove any of the packaging materials. A Callaway Golf Pre-Owned & Outlet Customer Service Representative will have to process a damage claim with UPS, have the damaged merchandise picked up from your location, and give you further instructions to receive a replacement. If you decide not to keep the items you purchased, please select the type of merchandise return you wish to use from the list below: Condition Disputes We provide a 100% guarantee on the condition of our clubs. We take great care in certifying every pre-owned Callaway Golf club we sell, including the assignment of a condition rating. If, during the first 15 days following the receipt of the purchase, you wish to return any product in the exact condition that you received it (has not been played with), a 100 percent refund will be given for the price you paid for the product. You will be responsible for the entire cost of the original shipping, handling and taxes and any costs incurred during the return of the club to us. Club Received Does Not Match Your Order If the club you receive does not match the order you placed with us, please contact our Customer Service department my sending us a message through your my eBay account, for assistance. A representative will help you determine the best way get the correct item to you as quickly as possible. Warranty Callaway Golf Pre-Owned & Outlet will cover the shipping costs for a replacement in which Callaway Golf Pre-Owned & Outlet was at fault or that qualifies for repair through our 12-Month Limited Warranty. Callaway Golf Pre-Owned & Outlet will only cover replacement shipping & handling costs to the original shipping destination of the order. UPS delivers all shipments Monday - Friday to both Commercial and Residential Addresses. UPS Second Day Air Service: If you choose, you can have the delivery of your items upgraded to UPS Second Day Air for the applicable cost listed on this item. Note: UPS Second Day Air items ordered on Thursday will arrive the following Monday. UPS Second Day Air items ordered on Friday will arrive the following Tuesday. Orders placed prior to 2:00PM CST will ship the same day pending verification. Orders that include custom options may require an additional business day to ship. UPS Standard Overnight®: If you choose, you can have the delivery of your items upgraded to UPS Standard Overnight® for applicable cost listed on this item. Typically, UPS Standard Overnight® items arrive one business day after leaving our facility, with delivery by 12:00PM.Note: UPS Standard Overnight® items ordered on Friday will typically arrive the following Monday. Orders placed prior to 2:00PM CST will ship the same day pending verification. Alaska/Hawaii Shipping Options: Items shipped outside the contiguous U.S. to Alaska or Hawaii can only be shipped via UPS 2-3 Day® Service. Ground service to Alaska or Hawaii is not available thus a shipping surcharge may apply. Orders placed prior to 2:00PM CST will ship the same day pending verification. Orders that include custom options may require an additional business day to ship. APO/FPO Addresses At this time we do not ship to APO/FPO addresses on eBay. Returns Policy Returns Policy 30 Day Unconditional Return Callaway Golf Pre-Owned wants you to be fully satisfied with every item you purchase from our eBay storefront. If you are not satisfied with the item you have purchased, you may return it within 30 days of your order date for a full refund of the product price. This does NOT include shipping or handling To qualify for a full refund: Accompanied by a Return Merchandise Authorization (RMA). Must be complete with all parts and accessories in-tact. To obtain a Return Merchandise Authorization (RMA) please log in to your eBay account and request an RMA for the item in question. Return Over 30 Days If more than 30 days have passed since the original purchase, the item cannot be returned under the Buy-Back Guarantee. It will, however, be eligible for trade according to the rules for the Trade In! Trade Up! Program. 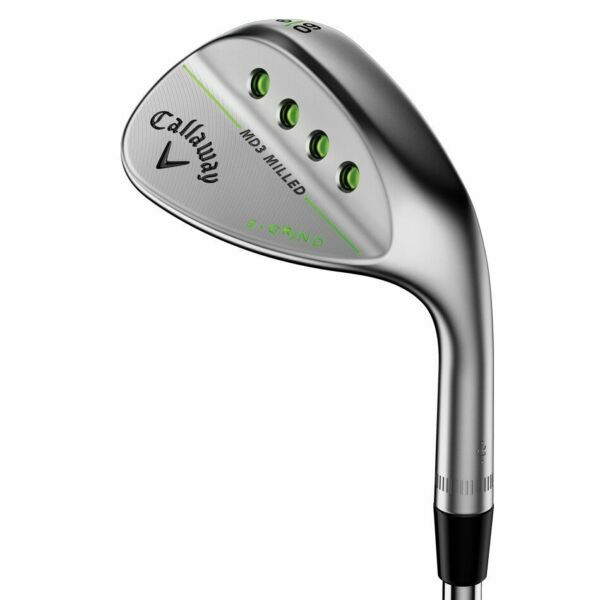 Returning Merchandise to Callaway Golf Pre-Owned & Outlet Please include the copy of your original invoice as well as the RMA number we provide so we can process your return as quickly as possible. The RMA number should be printed on the outside of the package used to send the returned merchandise back to us. The customer is responsible for all return shipping costs. We also recommended purchasing insurance for all returned merchandise. We cannot be responsible for loss or damage caused during return shipping. Refunds will be issued within 7-10 business days from receipt of your club(s), pending inspection and approval of your return. If there are any questions or adjustments to be made, we will contact you to discuss them before issuing payment. If a refund is applicable, the value will be remitted to you in the same form used to make your original purchase (i.e. credit card or check). If a refund cannot be made in the same form, a check will be issued and will be mailed to the billing address we have on file. Return Shipping Charges If there is a problem with your order that was the fault of Callaway Golf Pre-Owned & Outlet, we will take the necessary steps to make it right. We will be happy to reimburse the customer's ECONOMY GROUND return shipping costs in the following situations, provided the customer includes proof of the charges paid: The club received was not what was ordered The club received was defective (and you have contacted us within 15 days of receipt) Under no circumstances, will Callaway Golf Pre-Owned & Outlet reimburse any expedited shipping charges for returned merchandise. Why Buy From Us? Why Buy From Us? Guaranteed Performance Every Certified Pre-Owned club you buy is backed by Callaway Golf, which means you can shop with the confidence that you're getting the best possible quality. We guarantee that the condition of the club you get will match what was represented online. If you disagree, no problem. Send it back for a 100% refund of the purchase price. 12-Month Warranty The promise of a great Certified Pre-Owned club doesn't stop when you hit the course. Just like any new Callaway Golf product, a Certified Pre-Owned club comes with a 1-year limited warranty against defects. That means if something happens to your club that is directly related to an original manufacturing defect, we'll fix or replace it. No questions asked. Certificate of Authenticity Verification that your Certified Pre-Owned purchase is 100% Callaway Golf. You can shop confidently with Callaway Golf Pre-Owned & Outlet, knowing that Callaway Golf puts its stamp of approval only on Certified Pre-Owned products. See our range of Callaway Products Shop Now Powered by Frooition Frooition | No-js Template | eBay design, eBay store design, eBay shop design, eBay template design, eBay listing design (ver:froo_no_js) This listing is currently undergoing maintenance, we apologise for any inconvenience caused.